The Green Hill Zone Boss is the first boss encountered in Sonic the Hedgehog. Today, it remains one of the most famous boss fights in video game history, with its ball-and-chain recreated in other Sonic games and parodied by other series. The checkered ball appears to be leftover art from a pre-release of the game, which used the object as an obstacle which could be rode upon and pushed. A French commercial also shows the boss using a ball with a different design altogether. See the Game Development/Development section for more info. The attack pattern of this boss is quite predictable. Dr. Robotnik will swing the checkered ball back and forth, trying to hurt you with it. When he swings the ball toward you, the safest place to be is under one of the two platforms, where he cannot harm you. First off, get on one of the platforms. When Robotnik swings the checkered ball in the opposite direction, jump and hit him once. When he swings the ball in your direction, quickly get under the platform, and back onto it once it's safe. Repeat the process from here. You'll need to hit him 8 times before he's destroyed. There is also an alternative, and quicker way of defeating Robotnik. 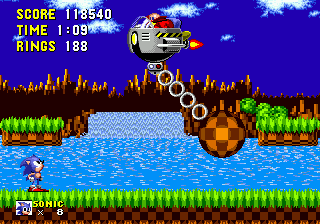 You can attack Robotnik at any time, due to the platforms. These are high enough so that you can simply attack. First, when you hear the music start, quickly get on the right platform and attack Robotnik as many times as possible during the fall. Now, stay on this platform as he'll strike to the left first. Attack quickly and you'll get probably 2 hits. Do the above until defeated. The boss reappears in both Sonic Advance and Sonic 4. The only changes in these versions are that in Sonic Advance the boss only takes 4 hits, and in Sonic 4 the boss has a pinch attack and can't be attacked before the checkered ball comes out, like most bosses programmed by Dimps. This page was last edited on 24 February 2019, at 21:38.